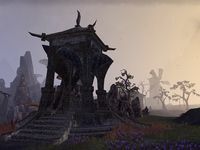 Hrogar's Hold is a farmstead in western Stonefalls, east of the Argonian village of Lukiul Uxith. There is a safebox with an Advanced lock on the ground floor of the Hold's manor, between two bookshelves in the left wing. Hrogar's Hold Objective: Save the residents of Hrogar's Hold from Goblin invaders. Hrogar's Hold Wayshrine is located south of the farm. This page was last modified on 6 March 2019, at 00:48.